The 2016 elections awakened Americans to a startling reality: the country’s political system is ripe for foreign interference. The Russians took full advantage of social media with bot armies and through unregistered foreign agents. While their influence garnered considerable attention and has led to increased enforcement of the Foreign Agents Registration Act (FARA), one area has remained largely off the congressional and media radar screens. Yet it remains a vital part of the way other governments try to influence policy in this country: the foreign funding of think tanks. Most Americans undoubtedly have little idea what a think tank actually does. Having worked at two of them myself, it’s fair to say that even those of us who have labored inside these basic building blocks for policymaking in Washington are often still trying to figure out just what many of them do. Still, whether you know it or not, you’ve certainly seen think-tank employees on cable news, heard them on the radio, or read their op-ed pieces. After all, think tanks are homes for so many of the “experts” who are the go-to sources for media coverage of foreign and domestic policy topics on just about any day — and are often key go-to sources for those making policy in Washington, too). You know, the former Department of Defense official you caught on NBC News discussing Iran or the Middle Eastern expert you saw quoted in Newsweek critiquing the Trump administration’s policies there. Outside the public eye, members of Congress and executive branch officials rely heavily on think tanks for expertise on a wide range of issues, for key congressional testimony, and even for quite literally helping craft public policy. Every year foreign governments pour tens of millions of dollars into those very institutions and, though many think tanks are tax-exempt non-profits, such donations often turn out to be anything but charitable gifts. Foreign contributions generally come with critically important strings attached — usually a favorable stance toward that country in whatever influential work the think tanks are doing. In other words, those experts you regularly read or see on screen, whose scholarship and advice Washington’s politicians and other officials often use, are in some cases being paid, directly or indirectly, by the very countries on which they are offering advice and analysis. And here’s the catch: they can do so without ever having to tell you about it. Such comments, like the events themselves, are just the norm in Washington think-tank life — unless, that is, you follow the money, in which case they seem both striking and supremely ironic. On any given day, Washington is, in fact, awash in foreign-policy events at think tanks. There, experts convene to publicly discuss just about every topic you’d want to hear about — except one, of course: their funding. And that is what made the Katulis-Salem exchange particularly interesting. What they and their follow panelists never mentioned at an event extolling the importance of think tanks in helping craft political Washington’s Middle East policies was this: both CAP and MEI have received millions of dollars from authoritarian governments in the Middle East. MEI has publicly reported receiving millions from Saudi Arabia and lesser amounts from the Persian Gulf states of Oman and Qatar. By far its largest donor, however, seems to have been the United Arab Emirates (UAE), reportedly making a “secret” $20 million contribution to that think tank, earmarked to “hire experts in order to counter the more egregious misperceptions about the region” and “to inform U.S. government policymakers.” In other words, in the spirit of that MEI panel title, the UAE’s funding was explicitly designed to shape that think tank’s — and so U.S. — policy considerations. While hardly in that $20 million range, CAP has also publicly reported receiving at least $1.5 million from the UAE. And keep in mind that those two think tanks are hardly the only ones receiving donations from countries in the Middle East. The Center for a New American Security, for instance, received $250,000 from the United Arab Emirates to produce a study on the need for the U.S. to export military-grade drones to countries like… the UAE. That think tank’s subsequent report on the topic notes that the U.S. doesn’t export drones to the UAE and other countries, but should because “this reluctance to transfer U.S. drones harms U.S. interests in tangible ways.” Never mind that a third of those killed in drone strikes in the devastating war in Yemen are civilians. The Brookings Institution received a $14.8 million donation from Qatar. In fact, according to a New York Times analysis, nearly all of the most prominent foreign-policy think tanks in Washington have accepted money from authoritarian regimes in the Middle East or elsewhere. And that, in turn, is just the tip of the iceberg, since think tanks are not legally required to publicly disclose their funding. If think tanks are to be believed, the money they receive from such funders changes little. Recent events at a number of think tanks, including the Center for American Progress and the Middle East Institute, should, however, give pause to anyone who assumes that such institutions are by their nature insulated from the influence of foreign funders. Recently, serious questions have been raised about whether CAP’s ties to the UAE, itself a close ally of the Saudi royals, contributed to its awkward response to the brutal murder of Washington Post journalist and Saudi citizen Jamal Khashoggi in that Kingdom’s embassy in Istanbul, Turkey. Following that killing, CAP released a response condemning the Saudis for their involvement in Khashoggi’s murder, but not calling for specific consequences to punish the Kingdom. According to reporting by the Intercept’s Ryan Grim, such consequences were stripped from the statement by a CAP staffer who just happened to be Brian Katulis. 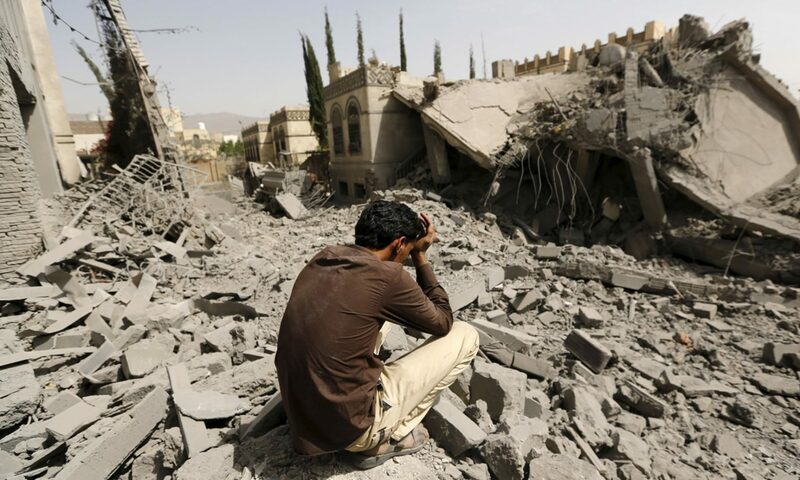 Then, in December, CAP largely sat on the sidelines as the Senate passed a historic resolution to end U.S. involvement in the devastating Saudi-UAE war in Yemen. At the MEI event in January, Katulis dismissed those giving “energy and dynamism” to “the Yemen debate” for ignoring “the full complexity of the challenges.” Jamal Khashoggi’s name wasn’t even mentioned. Just seven months later, bin Salman would reportedly authorize the brutal murder of Jamal Khashoggi and, in January 2019, Nazer himself would become the official spokesperson for the Saudi Embassy in Washington. Nazer’s case also illustrates a growing pattern of interactions between think tanks that receive foreign funding and the registered foreign agents of those countries. In fact, Emirati foreign agents last year reported contacting think tanks at least 85 times, according to an analysis of Foreign Agents Registration Act filings for a forthcoming report on the Emirati lobby in the U.S. by the Foreign Influence Transparency Initiative at the Center for International Policy, which I direct. Perhaps not surprisingly, CAP’s Katulis and MEI were among the top think-tank contacts for UAE’s foreign agents. According to 2018 filings, Katulis was contacted at least 12 times by the Harbour Group, which the UAE paid more than $5 million in 2018 to “influence U.S. policy,” according to the firm’s FARA filings. Katulis was a particular focus for them because he was helping to organize a “study tour” in which think-tank experts would take a luxurious trip to both the UAE and Saudi Arabia. That group also contacted MEI at least 14 times on behalf of the UAE, directing most of its efforts towards a “speaking engagement at MEI” for the Emirati ambassador to the U.S., the same man who had directed that “secret” $20 million contribution to the institute. Under current law, it is perfectly legal for think tanks that receive funding from foreign governments to also work with foreign agents registered to represent those very governments. FARA includes an exemption for those engaged in “bona fide… scholastic, academic, or scientific pursuits.” Like many parts of the FARA statute, it’s not at all clear what “bona fide” means, but think tanks are presumably exempt from registration if they meet this threshold. While the work done by both think tanks and registered foreign agents can sometimes overlap, the two are worlds apart on one critical score: transparency. Under FARA, registered foreign agents are required to disclose a considerable amount of what they do, including whom they’re working for, how much they’re being paid, and whom they’re contacting, as well as when and where they do it, on behalf of foreign principals like the United Arab Emirates. And most of that information is available online. Anything they distribute on behalf of a foreign backer must also include a “conspicuous statement” to let anyone know that what they’re reading is being distributed on behalf of a foreign principal. Think tanks receiving funding from foreign sources are, however, not required to do any of the above. While MEI and CAP do both disclose their funding sources on their websites — for which they should be commended — many think tanks do not. And few, even among those that do, mention any potential conflicts of interest that might be reflected in their published reports or the speeches and media appearances of their members. Even more worrisome, a Project On Government Oversight investigation by Lydia Dennett found numerous examples of think-tank experts not reporting or mentioning financial ties to foreign governments when testifying before Congress. Hiding such potential conflicts of interest is likely to leave the public and policymakers with the impression that they’re hearing truly objective experts, when they may, in fact, be taking testimony from someone who is functionally or literally on the payroll of a country with a deep stake in what they’re telling Congress. If think tanks are to remain credible sources of foreign-policy expertise, such ties must, at the very least, be laid bare. A first step would simply be to require think tanks to publicly disclose any foreign funding they receive, something easily done by amending the IRS code. In addition, just as registered foreign agents are required to include a “conspicuous statement” letting readers know they’re working on behalf of a foreign power, think tanks should have to fully disclose their funding sources and any potential conflicts of interest in all their written products, as well as at speaking engagements, especially testimony before Congress. It should also be incumbent upon the media to do a better job of vetting sources. Sure, journalists are extraordinarily busy, but if a simple Google search can reveal that the Middle East “expert” you’re quoting is being paid by a country in the Middle East, it behooves you to tell your readers that. CAP, MEI, and Brookings are, however, the exceptions. Most think tanks haven’t done “the right thing” and dropped funding from autocratic regimes. Nor are they likely to voluntarily increase transparency about that funding. The burden then falls on Congress to enact reforms ensuring that senators and representatives will know when the expert they’re hearing discuss a specific country or the region it’s in is being paid by that very same country. Failure to act could leave Americans asking a simple and uncomfortable question: Which country is buying U.S. foreign policy today? Ben Freeman, a TomDispatch regular, is the Director of the Foreign Influence Transparency Initiative at the Center for International Policy and author of The Foreign Policy Auction. Previous PostPrevious Bernie’s back, but is he all in this time? Could Sanders 2.0 Win It All, Getting the Democratic Nomination and Defeating Trump?